During operation Desert Shield (later Desert Storm), the United States led 34 countries in a fight to stop Iraq's annexation of Kuwait. Here, William Welsh presents a First Gulf War timeline of events that outlines the entire conflict, from the Iraqi invasion on August 2, 1990 to the negotiated cease-fire on February 28, 1991. On August 2, 1990, the Iraqi army invaded Kuwait with the aim of annexing the country. Within a week, U.S. forces began arriving in Saudi Arabia. Having received the support of the United Nations, the United States formed a coalition of 34 nations to liberate Kuwait. 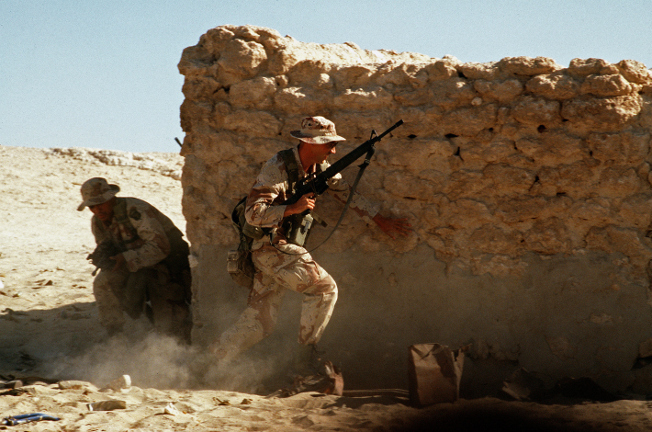 Operation Desert Storm began on January 16, 1991, and achieved its goal in less than two months. July 15, 1990 – Having drained his country’s finances in a protracted eight-year war against Iran, Iraqi ruler Saddam Hussein decided to conquer the rich neighboring country of Kuwait. Saddam claims Kuwait is stealing oil from Iraq’s Rumaylah oil field on the two countries’ border. His first overt move is to order his elite Republican Guard units to the border of Kuwait to intimidate the Kuwaitis. August 2 – After misleading Arab and western nations into believing he has no real intention to invade Kuwait, Saddam invades Kuwait with an army of 100,000 men and 200 tanks. The Kuwaiti royal family takes refuge in Saudi Arabia. The United Nations condemns the invasion through U.N. Security Council Resolution (UNSCR) 660. August 7 – The United States sends advance elements of what will become a large U.S. military force to Saudi Arabia. Ultimately, the U.S.-led coalition will field 670,000 troops, of which 425,000 are from the United States. November 29 – UNSCR 678 sets January 15, 1991, as the date that Iraq must withdraw from Kuwait or face armed expulsion by the U.S.-led coalition, which has the support of the United Nations. January 16, 1991 – Operation Desert Storm begins with a massive air campaign against Iraqi infrastructure and military forces. Over a 38-day period, the coalition flies more than 110,000 sorties against Iraq. The air campaign, which includes B-52 bombing runs, is designed to disrupt Iraqi communications, degrade its military forces, and break the morale of its soldiers. January 18 – Saddam sends SCUD missiles to strike Israeli targets in a vain attempt to widen the war and dissuade Muslim nations from supporting the coalition. January 29 – February 1. Saddam sends two mechanized divisions and one armored division to capture the northeastern Saudi Arabian town of Khafji on the Persian Gulf. With coalition air support, Saudi Arabian and Qatarian ground units repulse the Iraqis in the Battle of Khafji. February 24 – The coalition’s ground campaign begins. The coalition feints at coastal Kuwait threatening a Marine amphibious landing, but the main attack is inland against Saddam’s forces in Kuwait and Iraq. British SAS troops are the first to enter Iraq. U.S. M270 multiple rocket launchers shower Iraqi positions while bulldozers tear gaps in the sand walls along the border between Saudi Arabia and Kuwait for coalition tanks to advance. February 25 – An Iraqi SCUD missile hits the U.S. barracks at Dhahran, Saudi Arabia, killing 28 U.S. troops and wounding nearly 100. February 26 – Saddam orders his troops to begin withdrawing from Kuwait. Before they withdraw, the Iraqis set fire to 700 Kuwaiti oil wells. Panic sets in when the Iraqis realize they are going to be attacked as they try to leave Kuwait. February 27 – The U.S. 1st Armored Division attacks the Medina Division of the Republican Guard in a place known as the Medina Ridge in northern Kuwait where the Iraqi T-72 tanks laid an ambush. The 1st Armored Division detected the ambush and its M-1 Abrams engaged the T-72s at a distance destroying them with the assistance of artillery and air strikes. Coalition air strikes pummel columns of Iraqi soldiers attempting to flee Kuwait. Meanwhile, U.S. Marines and Joint Forces Command East (a pan-Arab unit) liberate Kuwait. February 28 – The U.S.-led coalition negotiates a cease-fire. Western leaders decide not to overthrow Saddam on the grounds it would destabilize the region. However, this leaves Shia Muslims and Kurds that rose up against Saddam open to persecution once the coalition withdraws. Tags Battle of Khafji, Desert Shield, Desert Storm, Dhahran, first gulf war, first gulf war timeline, Iraq, Kuwait, Medina Division, Muslim, Persian Gulf, Saddam Hussein, Saudi Arabia, SCUD missile, T-72 tank, Tanks, United States, UNSCR 660. Violence returns to Iraq and threatens to extend itself throughout the world.